"I feel extremely honored and very lucky to be included in this pantheon of great individual artists who comprise the Academy of Arts and Letters," Dylan, who was unable to attend the induction in person, said in a statement read at the ceremony. "I look forward to meeting all of you some time soon." 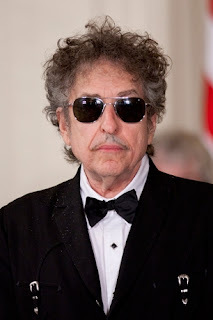 "For more than 50 years, defying categorization in a culture beguiled by categories, Bob Dylan has probed and prodded our psyches, recording and then changing our world and our lives through poetry made manifest in song – creating relationships that we never imagined could exist between words, emotions and ideas," read the citation awarded to Dylan. Pulitzer Prize-winning novelist Michael Chabon gave the keynote address, appropriately titled "Rock & Roll," and laughed at how he was obsessed with the opening line to Dylan's "Chimes of Freedom," in which Chabon mistook the word "toll" for something else, The Associated Press reports. "'Far between sundown's finish an' midnight's broken toe,"' Chabon said. "How many hours I had devoted to [the idea] . . . that midnight had toes, and that one of them, the big one, had been broken." Dylan was voted in as an honorary member after Academy officials could not decide whether to recognize him for songwriting or music. Instead of choosing one category where he could fit among the elite group of 250 regular members, the Academy voted him in as an honorary member – an even shorter list that includes Meryl Streep, Woody Allen and Martin Scorsese. "In 1983 the category of American Honorary membership was inaugurated, to comprise not more than 15 persons of great distinction in the creative arts whose work falls outside or transcends the Academy's Departments of Art, Literature, and Music," Academy president Henry Cobb said in a statement. "The members of the Academy have this year elected to American Honorary Membership Bob Dylan – poet, composer, musician, who has moved our culture with a consequence perhaps unmatched by any artist of our time." The Academy awarded a gold medal for the arts to novelist E.L. Doctorow and the sculptor Mark di Suvero, and voted in artists Richard Tuttle and Terry Winters, and writer Ward Just. Dylan was the only honorary member announced at the ceremony.